This darkness... showed that the projectile has passed the atmospheric strata, for the diffused light spread in the air would have been reflected on the metal walls, which reflection was wanting. This light would have lit the window, and the window was dark. Doubt was no longer possible; the travelers had left the earth. "I have lost," said Nicholl. "I congratulate you," replied Ardan. "Here are the nine thousand dollars," said the captain, drawing a roll of paper dollars from his pocket. "Will you have a receipt for it?" asked Barbicane, taking the sum. "If you do not mind," answered Nicholl; "it is more business-like." 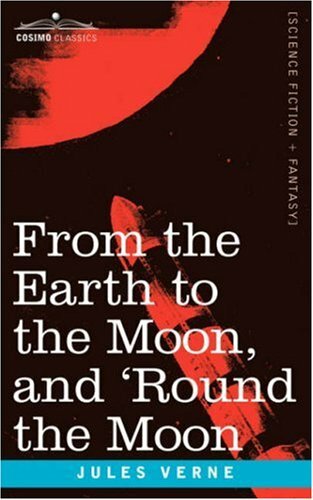 ~ ~ ~ This is the legendary novel of technological speculation and social satire that launched an entire genre of adventure fiction: Verne's From the Earth to the Moon and 'Round the Moon is the first story of space exploration and remains a beloved work of daring exploits-and surprisingly accurate scientific conjecture. When the members of the Baltimore Gun Club-bored Civil War veterans-decide to fill their time by embarking on a project to shoot themselves to the moon, the race is on to raise money, overcome engineering challenges, and convince detractors that they're anything but "Lunatics." With this work, Verne inspired the first science fiction film, 1902's Le Voyage dans la lune, and accurately predicted that that ideal location for a spacebase is in Florida. First published in France in 1865, this replica 1918 edition includes the sequel, 1870's Round the Moon. Also available from Cosimo Classics: Verne's Five Weeks in a Balloon OF INTEREST TO: science fiction fans, readers of 19th-century literature French author JULES GABRIEL VERNE (1828-1905) is considered the father of modern science fiction. Among his many groundbreaking books are Journey to the Center of the Earth (1864), 20,000 Leagues Under the Sea (1870), and Around the World in Eighty Days (1872).